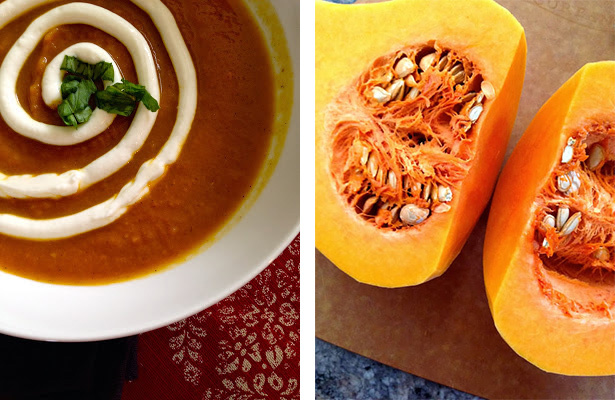 I have had several requests to make a pumpkin butternut squash soup, and what better time to make it than now! I am very pleased with the way it turned out! If you like it more spicy I recommend more of the cayenne, on the other hand if you want it sweeter add another Tablespoon of brown sugar. Heat the olive oil in a large pot. Add the butternut squash, apple, onion, carrots, and seasonings. Saute until onions are soft. I covered mine to get the squash to soften up faster. In the meantime, whisk together chicken stock, pumpkin, and brown sugar. Add this mixture to the pot. Add the water and bring to a boil. Once boiling, reduce the heat and simmer, uncovered, for 15 to 20 minutes. Blend the soup in a food processor or with a hand held blender until pureed. I pureed mine halfway through the 15-20 minutes simmer time so that I could see if I needed to add more water. Once you have pureed it, you can add water if it is too thick for you. Pour the soup back in the pot and keep warm until ready to serve. non-fat plain Greek yogurt, toasted pumpkin seeds, and pancetta.